Democrat Eric Swalwell currently represents Congressional District 15. Swalwell is expected to easily win re-election in 2016. Congressman Eric Swalwell proudly represents California’s Fifteenth Congressional District. 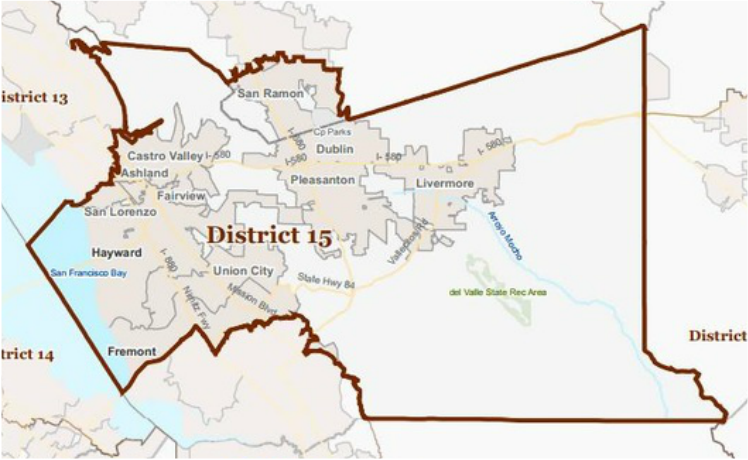 The District includes a large portion of the East Bay, where he grew up, attended public schools, and served his community upon returning home from college and law school. In November 2012, he was elected to the United States House of Representatives, promising to bring new energy, ideas, and a problem-solving spirit of working together to Congress. In the House of Representatives, Congressman Swalwell serves on the Committee on Science, Space, and Technology, and is the Ranking Member of its Subcommittee on Energy, which oversees the Department of Energy’s civilian research, development, and demonstration programs that are vital in discovering clean, sustainable sources of energy. He also serves on the Committee on Homeland Security, which is responsible for keeping our nation safe from terrorism and prepared to respond to either man-made or natural disasters. Hard work has defined Congressman Swalwell’s life, from his first job as a newspaper delivery boy at age ten, to odd jobs to help finance his education, to his public service as a prosecutor and city council member. His first passion was soccer, and he developed his skills to earn a Division I college athletic scholarship – and become the first person in his family to go to college. When an injury ended his dream of playing professional soccer, Congressman Swalwell turned toward public service. In the summer of 2001, Congressman Swalwell worked as an unpaid intern in the office of his Representative, Congresswoman Ellen Tauscher. He was a Capitol Hill intern the morning of September 11, 2001– a day that strengthened his commitment to public service and inspired his first legislative achievement: creating a public-private college scholarship program for students who lost parents in the attacks. At the University of Maryland, he created (and was the first to hold) the position of Student Liaison on the College Park City Council. After college, Congressman Swalwell graduated from the University of Maryland School of Law. Inspired by his father’s service as a police officer, he joined the Alameda County District Attorney’s Office to protect victims and serve the cause of justice. In the seven years Congressman Swalwell served in that office, he prosecuted thousands of cases and tried 34 jury trials to verdict, ranging from domestic violence, to elder abuse, to human trafficking, to three first-degree murders. He also assisted District Attorney Nancy O’Malley with the office’s federal advocacy, traveling to Washington, DC to pursue grant funding and advocate for tougher human trafficking laws. In addition to his service in the District Attorney’s office, Congressman Swalwell founded and served as chairperson to the Dublin High School Alumni Association. In 2006, he was appointed to and later served as chairperson of the Dublin Heritage & Cultural Arts Commission, where he helped build the City’s Heritage Museum. In 2008, Congressman Swalwell was appointed to the Dublin Planning Commission. In 2010, he was elected to the Dublin City Council, where he served alongside his longtime friend, mentor, and high school economics teacher and mock trial coach, Mayor Tim Sbranti. On the city council, he used a common-sense, bipartisan approach to pursue creative policies that fostered new jobs, balanced the city’s budget every year, and created the Wine Region Subcommittee to protect open space, entice viticulture, and enhance the region’s economic viability. He is the oldest of four boys and son to Eric Sr., a retired police officer, and Vicky, who works as a secretary.